A view along Columbia Road from the Bank of America building, which is part of a site that will be home to an $18 million new library. Jennifer Smith photo.. The city is moving ahead with plans to rejuvenate the Uphams Corner village of Dorchester, which it envisions as a thriving arts district and home to new cultural and community hubs. In a community meeting at the Salvation Army Ray and Joan Kroc Corps Community Center last week, Boston development officials offered an overview of the process. Uphams Corner is identified as a potential “enhanced neighborhood” that is ripe for investment in housing, the arts, improved transit, and bolstered Main Streets groups. Pilot programs have been floated at the state and city level to improve the use and reliability of the Fairmount Line, the main rail option for Uphams Corner residents. The city is not re-planning the area, said John Barros, the city’s chief of economic development, at the public meeting last Wednesday. Goals set out in the Imagine Boston Plan, the Uphams Corner Station Area Plan of the Fairmount Indigo Planning Initiative, and the arts-focused Boston Creates will be discussed in a four- to six-week implementation planning process that offers the opportunity for a “leadership moment,” Barros said. “Uphams Corner can serve as a pilot for the kind of growth we can see, the kind of support for local businesses, the kind of vibrancy without moving everybody out,” he added. At the end of the planning stage, the city and its partners will release a Request For Proposals for Uphams Corner village, laying out developments they hope to see at several prominent and underutilized lots. Presentation boards have identified six distinct parcels, some owned by the city, some by Dudley Street Neighborhood Initiative (DSNI). They are the Strand Theatre; a city-owned municipal parking lot on Hamlet Street; two Columbia Road bank buildings, Citizens Bank and Bank of America; a small parking lot beside the Citizens building; and a larger lot next to the Bank of America building. “Neighbors have been asking us for a long time to look at the Strand Theatre, reinvest in the Strand Theatre, make sure it’s affordable, make sure it’s active,” Barros said. So that idea was folded into the plan. To develop without displacement, the city worked with the non-profit DSNI to identify locations for affordable housing. The two joined forces to purchase the Citizen’s Bank building and two associated lots. Acquiring the bank building was a new partnership model for the city, Barros said. It used city acquisition funds to assist the DSNI land trust in purchasing the three parcels in April for $1 million. Tony Hernandez, director of Dudley Neighbors, Inc., told the Reporter in September that the trust was open to giving the city control over the large parking lot next to the Bank of America building, which the city acquired in February after a two-and-a-half year process. Other parcels and property owners could potentially come on board the planning process, officials said. Santander, which owns property at the corner of Cushing Avenue, Columbia Road, and Stoughton Street, has expressed a willingness to hear planners out on potential concepts for that prominent site, Barros said. Attendees at the meeting brought up the status of the Leon Electric building, a longtime neighborhood eyesore next to the Uphams Corner commuter rail station. “We’ve been talking about those buildings forever,” Barros said, noting that the city has “gone after it and gone after it” only to have the owner continue to raise the price just above market rate. Some owners are sitting on land waiting for its value to increase, Barros said, stalling any efforts to plan or redevelop the sites. There is potential for a more drastic solution, if the community chooses to push for it, Barros said. The showpiece element of the envisioned Uphams Corner of the future is the $18 million library branch that is planned for the Bank of America building site and the adjacent DNI-owned parking lot. 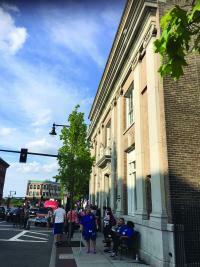 City and community leaders emphasized that the bank building itself – constructed in the 1910s as the home of the Dorchester Trust Company – is not necessarily going to be the library. The footprint of the Bank of America parcel and the adjacent parking lot comprises 8,251 square feet, more than enough space for a state-of-the-art library building. Books remain the core service that the city’s libraries provide, Leonard added, but people increasingly rely on them for internet access and work areas. The new library could include programming space for the staff and community, he said, but there is also the flexibility to imagine multiple uses for a new facility. Comments on fostering a cultural or arts district could be that tie-in, Leonard said. So he hopes to take input from the community on a possible culturally connective role for the new branch, particularly with its proximity to the Strand Theatre and other artistic resources.